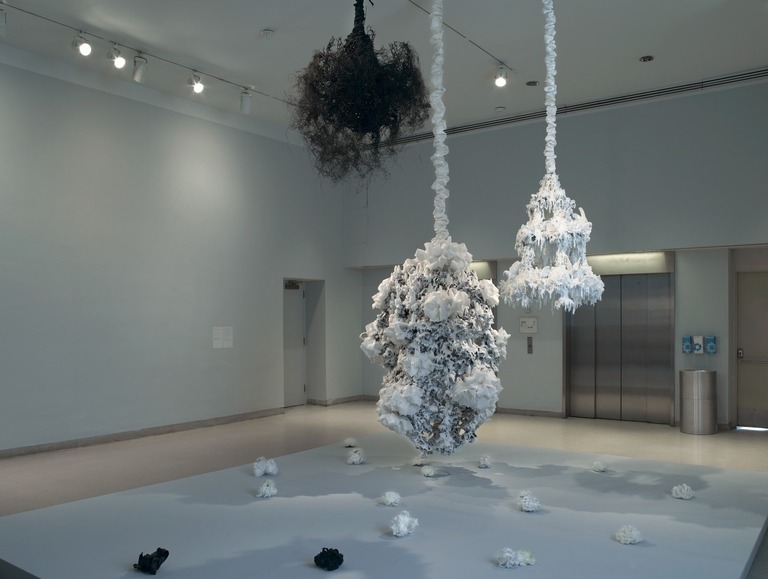 Petah Coyne’s fantastical forms, presenting a beauty that slides into the grotesque, allude to death and decay. Her large, arresting sculptures are neither abstraction nor figuration, but exist somewhere be- tween the two. 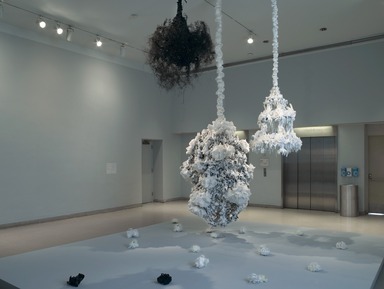 Using a wide range of nontraditional materials including hay, wire, black sand, specially formulated wax, silk flowers, ribbons, artificial birds, earth, hair, and trees, Coyne often veils or covers objects as though they were artifacts frozen in time. 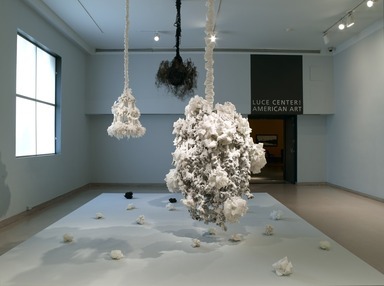 Often hanging from the ceiling, her sculptures project a sense of unease and fragility. Although the materials appear delicate, one senses the weight and density of the works—the gossamer-like Untitled 816 (Dr. Zhivago), for example, weighs three hundred pounds. Coyne is part of a generation of feminist sculptors who came of age in the late 1980s after Minimalism. Like many of her contemporaries such as Ursula von Rydingsvard, she seeks to integrate themes of nature and the self in her works.